Six new images containing Chandra data have been released to celebrate American Archives Month. The Chandra Data Archive ultimately houses all of the observations obtained by the telescope. The scientific community and the public have free access to the data in Chandra's archive. Each year, NASA's Chandra X-ray Observatory helps celebrate American Archive Month by releasing a collection of images using X-ray data in its archive. The Chandra Data Archive is a sophisticated digital system that ultimately contains all of the data obtained by the telescope since its launch into space in 1999. Chandra's archive is a resource that makes these data available to the scientific community and the general public for years after they were originally obtained. Each of these six new images also includes data from telescopes covering other parts of the electromagnetic spectrum, such as visible and infrared light. 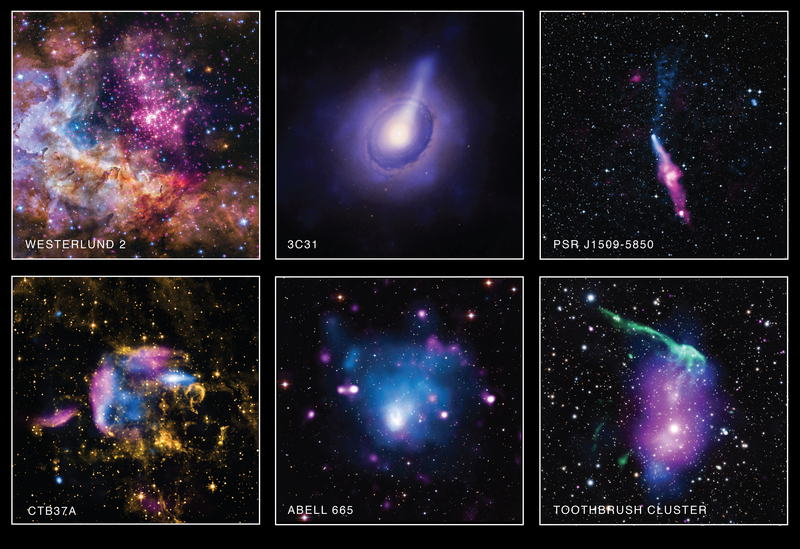 This collection of images represents just a small fraction of the treasures that reside in Chandra's unique X-ray archive. 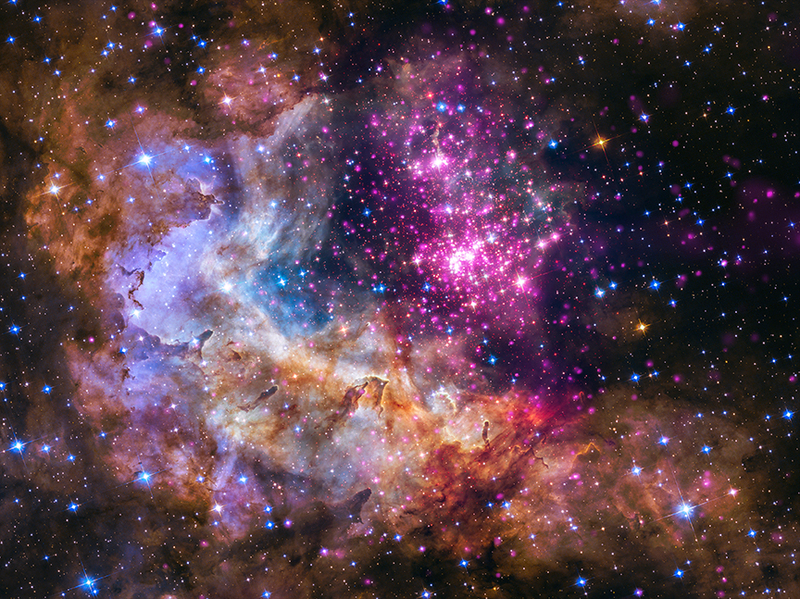 A cluster of young stars - about one to two million years old - located about 20,000 light years from Earth. Data in visible light from the Hubble Space Telescope (green and blue) reveal thick clouds where the stars are forming. High-energy radiation in the form of X-rays, however, can penetrate this cosmic haze, and are detected by Chandra (purple). X-rays from the radio galaxy 3C31 (blue), located 240 million light years from Earth, allow astronomers to probe the density, temperature, and pressure of this galaxy, long known to be a powerful emitter of radio waves. The Chandra data also reveal a jet blasting away from one side of the central galaxy, which also is known as NGC 383. Here, the Chandra X-ray image has been combined with Hubble's visible light data (yellow). Pulsars were first discovered in 1967 and today astronomers know of over a thousand such objects. The pulsar, PSR J1509-5850, located about 12,000 light years from Earth and appearing as the bright white spot in the center of this image, has generated a long tail of X-ray emission trailing behind it, as seen in the lower part of the image. This pulsar has also generated an outflow of particles in approximately the opposite direction. In this image, X-rays detected by Chandra (blue) and radio emission (pink) have been overlaid on a visible light image from the Digitized Sky Survey of the field of view. Astronomers estimate that a supernova explosion should occur about every 50 years on average in the Milky Way galaxy. The object known as CTB 37A is a supernova remnant located in our Galaxy about 20,000 light years from Earth. This image shows that the debris field glowing in X-rays (blue) and radio waves (pink) may be expanding into a cooler cloud of gas and dust seen in infrared light (orange). Merging galaxy clusters can generate enormous shock waves, similar to cold fronts in weather on Earth. This system, known as Abell 665, has an extremely powerful shockwave, second only to the famous Bullet Cluster. Here, X-rays from Chandra (blue) show hot gas in the cluster. The bow wave shape of the shock is shown by the large white region near the center of the image. The Chandra image has been added to radio emission (purple) and visible light data from the Sloan Digital Sky Survey showing galaxies and stars (white). The phenomenon of pareidolia is when people see familiar shapes in images. This galaxy cluster has invoked the nickname of the "Toothbrush Cluster" because of its resemblance to the dental tool. In fact, the stem of the brush is due to radio waves (green) while the diffuse emission where the toothpaste would go is produced by X-rays observed by Chandra (purple). Visible light data from the Subaru telescope show galaxies and stars (white) and a map from gravitational lensing (blue) shows the concentration of the mass, which is mostly (about 80%) dark matter.